Arsenal star Henrikh Mkhitaryan has made a fairly bizarre claim about Arsene Wenger that not too many fans will agree with at this point. The Frenchman stepped down as Gunners boss at the end of the season, bringing his remarkable 22-year reign at the club to an emotional end. While there’s no doubt Wenger got a fine send-off from Arsenal fans, the reality is many have wanted him gone for some time as results took a serious turn for the worse in the second half of his reign, particularly in his final two seasons. Wenger has now been replaced by Unai Emery, with the Spaniard unveiled by the north London giants at a press conference on Wednesday. Mkhitaryan is the first Arsenal player to speak about the new man in charge, and while he seems keen to see what the 46-year-old will bring to the Emirates Stadium, he also paid a glowing tribute to his predecessor Wenger. However, the Armenian may have gone slightly overboard by saying he felt the 68-year-old could have stayed for another ten years without anyone begrudging him that opportunity. 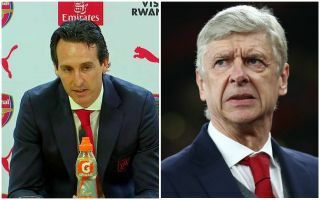 ‘I hope he (Emery) will bring new tactical ideas and spirit to Arsenal,” he told Vivaro News. ‘I hope he will succeed. I still haven’t had the opportunity to meet him, we didn’t have time to talk with each other. ‘Not only the players but the whole staff were sad (about Wenger). It’s not that easy to handle the exit of a man who managed the team for 22 years. There surely isn’t an Arsenal fan in the world who agrees with that, with Wenger seen by so many as under-achieving for such a long time, with the club not winning a league title since 2004, and just three major trophies since 2005.